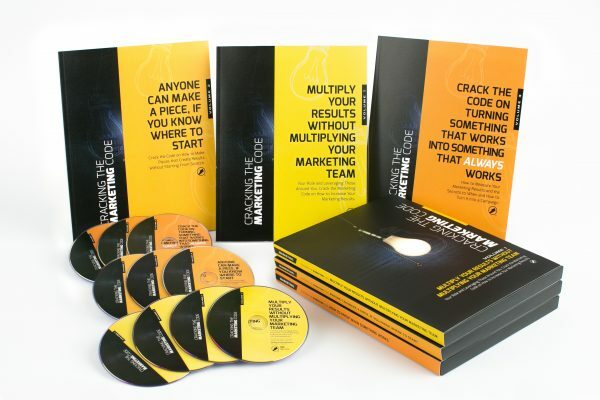 Multiply marketing results, create new, exciting and reusable campaigns and turn what currently works in your office into something that always works. This 3-volume self-study series will allow your marketer to excel in new patient attraction and as a result, increased revenue. This is your opportunity to give them the MBA they never imagined they would have. They will gain a better understanding in their job and what it is that you expect from them, increase their results and improve their Marketing investments. It’s time to train your marketer to become a marketing machine! Having a marketer is not enough. You need a trained, results-producing marketer. Cracking the Marketing Code will enhance their marketing efforts, provide them with new perspectives and take their marketing to the next level. Not only will they learn how to create effective campaigns, but also persuasive copy-writing techniques that will boost conversions, how to avoid complacency, advanced lessons in creating multi-step, automated sequences and how to improve communication with Patients, the Doctor and team! Why wouldn’t you want to multiply results? Why wouldn’t you want to receive done-for-you pieces and copy that you can edit and send out immediately? Why wouldn’t you want to increase New Patients? These are just a FEW of the things that your Practice will gain with Cracking the Marketing Code. Learn what it means to be a marketer. Learn what your role really is and crack the code on how to leverage other people to increase your marketing results. Gain a full understanding of what it means to be a marketer (role definition is the key to success) and how to leverage the rest of your team. In addition to mastering basic marketing principles, you’ll gain 9 key marketing tips from Jay Geier, outsourcing tips and insight on which vendors you should keep on hand. Learn how to avoid getting stuck. Crack the Code on how to make pieces (emails, mailers, sequences, programs) that create results without starting from scratch. Understand how Kolbe directly relates to marketing, master copywriting strategies, learn how to utilize resources that are right in front of you and create your own swipe file collection! I was just promoted to Marketing Director, it’s a new field for me. I’m starting from scratch, this has been an educational experience and I am ready to start implementing it now! This Training has been excellent! I’m very excited that S.I. has put together some marketing campaigns that we can tap in to!